In his address at the Mago Earth Park Dedication Ceremony on December 16, 2009, Ilchi Lee introduced the Earth Citizen Movement and One Dollar Project organized by the International Brain Education Association (IBREA) Foundation (ibreaus.org), of which he is president. A 501(c)3 non-profit, the IBREA Foundation created the Earth Citizen Movement to promote greater individual responsibility for helping humanity and the planet. This global, grassroots campaign is based on Ilchi Lee’s concept of an Earth Citizen—someone who realizes that putting their citizenship on earth before their identification with their race, religion, or nationality will help unify all people and allow them to work harmoniously for the betterment of the earth and its people. Earth Citizens take on unlimited responsibility for a healthy earth community. 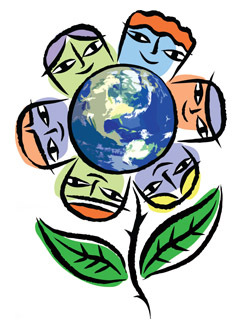 Early in 2009, the Earth Citizen Movement launched the One Dollar Project. By collecting just $1 a month from many Earth Citizens, the One Dollar Project knows it can have a significant effect on people’s lives. In addition to the effect the money donated can have, the intention, sense of ownership, and spirit of peace that accompany a donation can also make a considerable impact on the earth. The donations are given to organizations that further the United Nation’s Millennium Development Goals because these goals are in the same spirit as the Earth Citizen Movement’s goal of creating health, happiness, and peace for all humanity. The Project’s first donation recipient is UNICEF’s HIV “Prevention of Mother to Child Transmission” (PMTCT) program. Along with increasing services for detection, treatment, and transmission prevention of HIV in pregnant women, PMTCT’s offers empowering education and counseling, including vocation and mental health support. (http://www.unicef.org/aids/index_preventionyoung.html). Since the project started, IBREA Foundation has collected $46,770.78. Of these funds, $38,872.87 has been donated to UNICEF. Click below to see some of the donation receipts. IBREA Foundation envisions a world where humanity recognizes the human brain as the source of our creative power and unlocks the potential of the brain for purposes of health, happiness and peace. Besides launching the One Dollar Project, it has organized events and workshops for the dissemination of Brain Education. It sponsors the annual International Brain Education Conference and Brain HSP Olympiad, develops Brain Education programs and supports research on them, and publishes the quarterly Brain World magazine, and other brain-related literature. To learn more about the One Dollar Project, please visit www.iearthcitizen.org. 2 Responses to "The Earth Citizen Movement’s One Dollar Project: Money Used for Health, Happiness and Peace"
Our members love the One Dollar Project! So, every Sunday we opened a “One Dollar Class” where members who are also instructors (and Earth Citizens) teach class. People who attend class pay $1 and then also become Earth Citizens. By coming to this class they give to both themselves and the Earth. What a great idea Youn! What center are you from if you don’t mind my asking?